PRAGUE -- The Chinese U-18 sudoku team has swept the individual medals and clinched the team sliver at the 13th World Sudoku & Puzzle Championship running from Nov 4 to 11 in Prague. Chinese team leader Zhang Haijun said Thursday that a total of 248 players from 33 countries and regions participated in the tournament in which the Chinese team with an average age of only 17 appeared to be the youngest one. In the U-18 individual competitions, Ming Letian, Dai Tantan and Chen Shiyu made a 1-3 finish for China with stunning performances. Wang Shiyao, the 14-year-old Chinese player who made her debut in Prague, got the Best Newcomer Award. 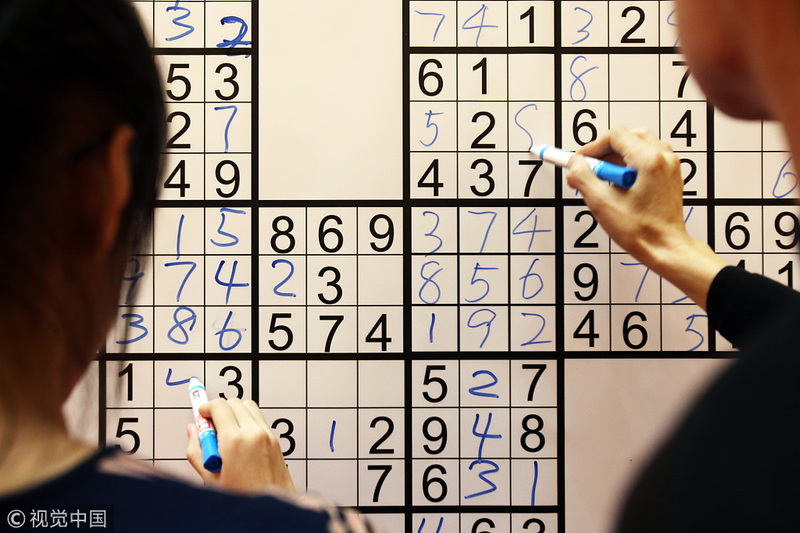 She also set a new world record in Sudoku on Wednesday when she managed to solve the 9x9 sudoku grid in 54.44 seconds. Zhang Haijun said, "China sent 16 players to the championship. They were all selected from the 2018 China Sudoku Championship." Since 2012 when the Chinese Sudoku players won their gold medals at team competitions, China have been standing on the medal podium, as well as the third time for them to win the team silver. Japan took the gold and Germany got the bronze in the U-18 team competition. Zhang Haijun said, "This year's team competitions got changed. Such as, only first four teams who passed the heats could proceed to the final. The degree of difficulty of the final game got higher too."